Place of Origin: Rio Aripuan and upper Rio Madeira basins, Brazil. Typical Tank setup: Well planted with rocks and driftwood/bogwood. 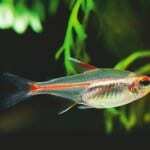 Additive to make the water appear brownish in colour will make the Royal Tetra feel more safe and would appear to be more natural to their habitat however this isn’t essential for the fish to be healthy. 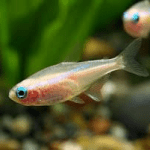 Feeding: Will do well on normal tropical flake food however occasional treats of frozen foods such as brine shrimp and daphnia would be welcome. 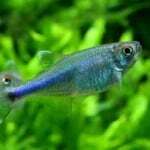 Sexing: Male Blue Emperor Tetra tend to be slimmer and more colourful than females. 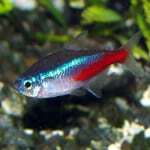 The males adipose fin tend to be blue however the females is primarily red. 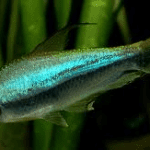 Breeding: Water temperature of 25°c, very soft water of PH 5 or lower and extremely subdued lighting. The eggs are laid over fine leaved plants and hatch in 24 hours. 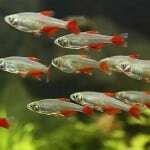 Feed the newly hatched fry on fine live food infusoria or liquid food for 10-12 days. 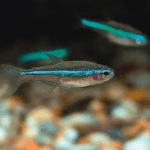 They should then be able to feed on newly hatched brine shrimp. 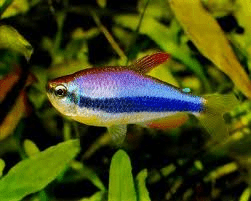 Additional Information: This pretty little species can be seen for sale with various common names, including the ‘blue emperor’, ‘regal’ or ‘royal’ tetra. 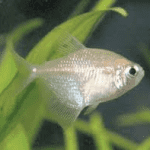 It’s sometimes confused with the emperor tetra, Nematobrycon Palmeri but can be easily distinguished as it possesses an adipose fin, whilst Nematobrycon species do not.